We Will 'Never Be Broken': Facing imminent eviction, Water Protectors stand their ground. Officials refuse to extend the Wednesday eviction deadline as Indigenous protectors plea for help. Faced with an imminent evacuation deadline, Indigenous opponents of the Dakota Access pipeline are vowing to stand their ground despite threats of arrest and possible violence. 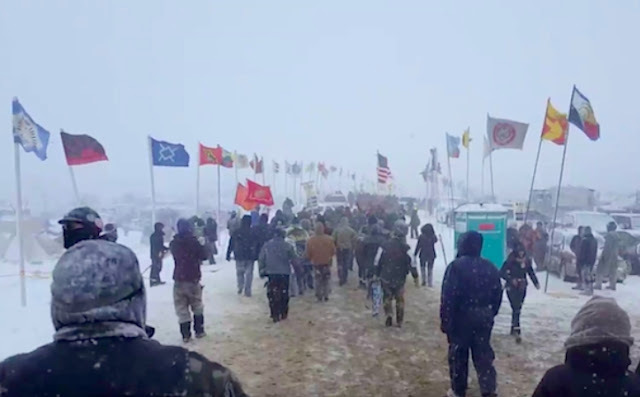 The U.S. Army Corps of Engineers on Tuesday refused to extend the Wednesday 2pm GMT deadline for the few hundred remaining water protectors to vacate the Oceti Sakowin camp, claiming that the camp is at risk of flooding. Representatives have asked for an extension, saying they can clear out without the Corps' help, but need more time. 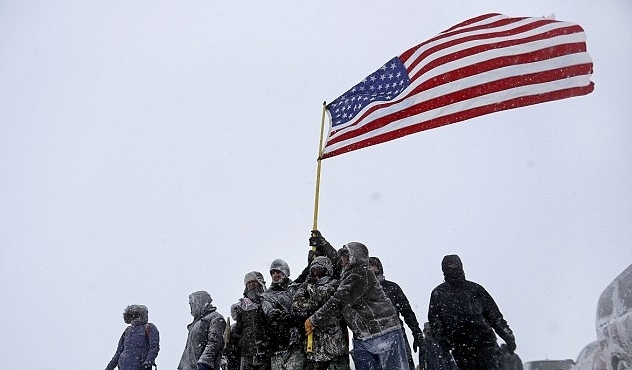 "We have 48 hours before militarized law enforcement raid Oceti Sakowin camp. Elders and children need protection," states a video that was distributed on Monday by women from the Standing Rock Sioux tribe. "In the history of colonization, they've always given us two options," said another. "Give up our land or go to jail, give up our rights or go to jail. And now, give up our water, or go to jail. We are not criminals." The video concludes with a plea for other protectors and media to come to the camp before the forced evacuation, saying: "We need your help." Many say that Wednesday could be the protectors' "last stand." "They don't understand people are willing to die here," one 90-year-old woman told The Intercept, which on Tuesday published a separate video documenting the police build-up. "They don’t understand we will not back down. We have our ancestors with us and we are in prayer that Tunkashila (Great Spirit in Lakota) will guide us in our freedom." In addition to the Indigenous protectors, U.S. military veterans have also returned to the camp and have vowed to "hold the line with our brothers and sisters in the spirit of peace and unity." Responses to "Forced Removal: Another "Trail of Tears" Happening at Standing Rock"
Sending love and prayers for everyone. Stay safe; stay strong. You are loved and honored by countless others throughout the world. Hiy! Hiy! This is total BS ! This doesn't just effect Standing Rock, events that have been going on there for way to long are and will effect the whole world. It's been said many times. Now what I want to know is where are all these people with honor ! STEP UP STEP UP NOW EVERYONE !DRASTIC MEASURES CALL FOR DRASTIC CHANGES FOR THE BETTER! WE ARE LIVING IN A SCARY LIFE AND IF PEOPLE ALL OVER THE WORLD DON'T DO SOMETHING RIGHT NOW WE'RE ALL IN VERY BIG TROUBLE! THINGS WILL JUST KEEP GETTING WORSE. GOD HELP US I PRAY FOR A BETTER LIFE FOR ALL.